I came across this photo while I was engaged in the intellectually stimulating task of backing up data. 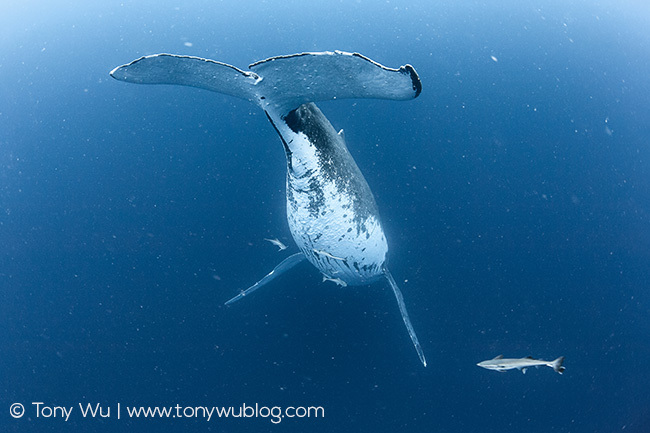 It’s a photo of a singing humpback whale (Megaptera novaeangliae), with attendant remoras. I took this photo in 2007, which is practically ancient history. If memory serves me correctly, this whale was about 20m down at the fluke, and the water not terribly clear. I recall hanging out just to enjoy the reverberation of the deep booms, when one of the remoras disengaged from the mother ship and sauntered over to take a look at me. The fish hung around for a while, but eventually thought the better of it and returned to home base. The camera was a 12.8 MP Canon 5D, which was super-advanced tech at the time. You may not be able to tell from a relatively small jpg like this, but the file quality is nowhere near that of the output from my current cameras. I suppose this should go without saying, but it is amazing how much digital camera technology has improved during the intervening years.